Editor’s Note: We are catching up on our narratives after a long absence. Over the next few weeks we will have updates from our past Luncheon Society gatherings. Since the dawn of time, it seemed that women always found themselves several paces behind men. Part of it was societal, most was legislative, but writer Hanna Rosin makes the case that in this Post-Industrial Information Age, women have the intuitive tools, the skills, and the drive to pull ahead. Only a generation ago, women found it hard to get their own credit cards or to purchase a home, without the signature of a husband or the explicit consent of her father. However, as Hanna writes, something earth-changing took place in 2010 which was essentially ignored in the mainstream media. This was first year that women surpassed men in the workplace. More tellingly, the trendlines suggest that this is not some fluke. When it comes to earning undergraduate degrees, three of the five diplomas issued go to female graduates. 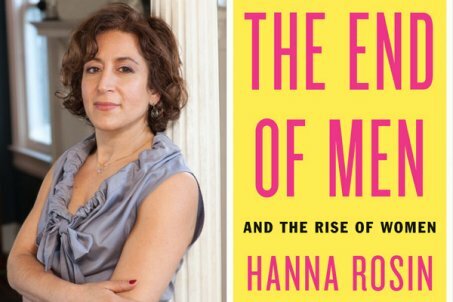 In her book “The End of Men,” Hanna Rosin makes the chase that we are living in the eye of one of the most transformative gender shifts since man emerged from the caves built the modern world; women are poised to take over. So what does this mean? In Rosin’s book, she makes the case that women have latched on to the opportunities unavailable to their mothers and grandmothers generations earlier. Her book began as a 10,000 word thought piece in The Atlantic in the summer of 2010 and based on the chatter that developed, she was encouraged to expand it into a full length book. Rosin is no stranger to the revolutionary idea and as the co-founder of Double X Blog for Slate Magazine, she has explored gender issues for more than a decade. While she may paint with a broad brush at times, she elevates a discussion both men and women alike should read. She even brings the gender conversation into clearer focus by including her husband and son. We have lived in a world where there has been an appreciation for things male. Who can forget the opening scene of The Godfather, when Luco Brazi—who served as The Don’s brutal muscle—practiced his lines, hoping that Connie’s first child be a masculine son. We see it in the crowned heads of Europe who proffered the rights of succession to a male child, even if there were several older (and able) princesses in the wings. Had George VI and Queen Elizabeth produced a male child—even years after the birth of Princess Margaret—he and not the then-Princess Elizabeth would have succeeded her father. This week in The Netherlands, Queen Beatrix abdicated in favor of her son Willem-Alexander. After serving 33 years after her mother in 1980, the rights of succession of the Dutch Royal family are now gender neutral. Princess Catharina-Amalia will someday succeed her father, regardless of gender and any other children which may emerge. Change even comes to institutions that have been frozen by centuries of tradition. Look no further than today’s American adoptions of Chinese orphans. Until recently, many rural families living under China’s “One Child Program” gladly gave their daughters for adoption so that they can pull a “mulligan” and hope for a male. There is a double irony here. These throwaways came to the United States, benefitted from our lifestyle, and experienced equalities only dreamed about in their homeland. The second irony is that the shrinkage of women in China has produced a glut of single men who cannot find a wife. The gender imbalance which started 25 years ago has now flowered to full adulthood. In the case of American women, if the 20th century was transformative, the possibilities for the 21st are even brighter. The skillsets needed in this Information Age are brain and not brawn where collaborative qualities trump the Lone Wolf and male temptation to go it alone. In the past, women rose to power as extensions of the men in their lives, often as afterthoughts. The late Katherine Graham, who led The Washington Post through the bare knuckle era of Vietnam and Watergate, took over the paper only when her husband, the brilliant but mentally ill Philip Graham, took the family rifle and blew out his brains after another stay at a psychiatric institution. After conquering the learning curve, she quickly placed her thumbprint on the Post’s coverage and its subsequent acquisitions. The irony, of course, is that Katherine Graham grew up with The Washington Post because her father purchased the paper in the 1930’s when it was considered a second rate also-ran. While Philip Graham pointed the paper in the right directions during those early years, it was Katherine Graham who made it great. The decisions to publish the Pentagon Papers filched by Daniel Ellsberg and her later support of both Woodward and Bernstein made all the difference—something that Ben Bradlee has always been quick to point out. Rosin is also quick to note that while men tend to be the destroyers modern nations are turning to the nurturing power of female leaders are their once-broken states go through a rebuilding process. The leadership of Rwanda and Liberia, after their national bloodletting that decimated their national treasure and left these once ascending nations in chaos chose women to lead them back front the brink. Ellen Johnson Sirleaf, the President of Liberia, who demonstrated astounding courage to step up and stare down thugs like Charles Taylor and Samuel Doe, worked tirelessly to begin to improve her nation. Women crossed tribal lines and voted for Sirleaf after so much war and violence bled the nation dry. In Rwanda, which experiences tribal bloodletting of genocide once per generation, elected a majority of women in their parliament after a male-driven genocide killed 750,000 people within eight weeks. What is starting to take place within Governor’s mansions and boardrooms has begun to trickle down throughout the rest of society. Now that the gender equivalents of Jim Crow were declared unconstitutional two or three decades ago and replaced by the a variety of civil rights legislations that addressed gender issues, smart organizations have begun to realize that its smart to have a workforce as diverse as your customer base, More interestingly, a great majority of the 8 million jobs lost during The Great Recession belonged to men and they were in hard-hit industries like construction, jobs which are dominated by males. This combined with the new trendlines of what is required for 21st century employment tend to will favor women for the longer term. Rosin makes the case that most families, while appearing patriarchal in form, were actually matriarchal in fact. Within the family structure, women have always held the reins of power—certainly in America—but that power to influence stopped at the front door. Outside the home, women found themselves relegated to second or third class status. Now it has moved out of the home and into university classrooms where women are out-graduating men. Within academic departments that seemed to be allergic to a female presence, (i.e. math and the sciences) women are making strides, albeit slow but steady. The Failure of Men. However, Rosin offers many examples of women who have carved out successful lives for themselves in education and business who have stepped forward because the men in their lives have turned out to be utter failures. Like failed states who wander around the edges of a difficult job market, these men have forced women to support their families. Many of these men found themselves with obsolete skillsets that placed themselves at the front of the unemployment line while the educatory success rates of women have created opportunities their mothers and grandmothers. However, as Sheryl Steinberg pointed out in her book, “Lean In,” there seems to be “a burning out” point within middle management and women self sabotage themselves when forced to make the heartbreaking decisions between career and family. Men, writes Rosin, are never forced to make these decisions because childcare remains a default female role. For women, it’s the need for childcare that serves as the hidden hand that holds many back. Generations ago, men actually bragged that they never changed a diaper or mopped a floor; today that kind of behavior sends you to the front of the line of a divorce court. Both Hanna Rosin and Sheryl Steinberg head down the same street, at different speeds, with the former talking about the opportunities and the latter talking about the pitfalls. Rosin is saying that women are better prepared for the 21st century workplace because of the skills they learn in college put them in s better spot then men. Steinberg argues that many women within middle management self sabotage their careers when faced with making the choice between work and family. In the end, the responsibilities of what takes place when the work day has ended still fall on the shoulders of women. The safety nets of old have been replaced by the anxieties of the present. The times when guys could stumble their way through high school in a fog but emerge with a job at the local plant-one that paid good wages and benefits—are long gone. Academic failure fast tracks you into a death spiral of downward mobility. However, what Rosin argues is that women as a gender are doing more of the right things than men to adjust to these realities. What makes Rosin’s book prescient is that she details how far women—and we as a nation have come—but how far we still have yet to travel.